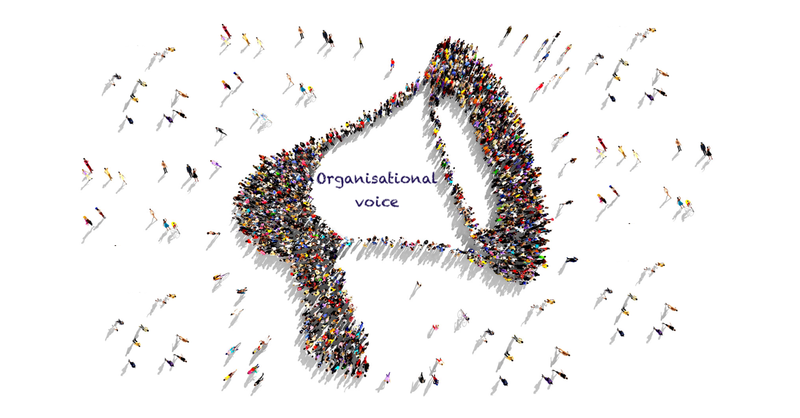 Can you hear feedback when it is offered, or does it get lost in the way it is delivered? 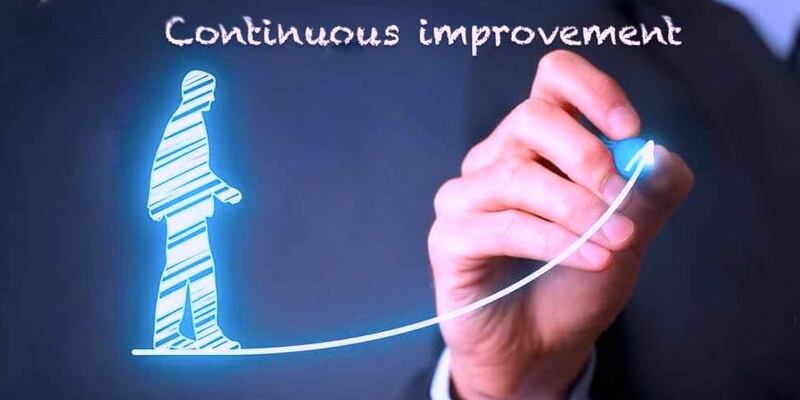 Performance conversations are often not handled well in many organisations. Sometimes the message (though accurate and/or helpful) can be lost in the way it is delivered. Most of us don’t like to be told what to do and we sometimes do the opposite of what we are told, even when the information is helpful. We often give more weight to negative feedback or feel uncomfortable when criticised. 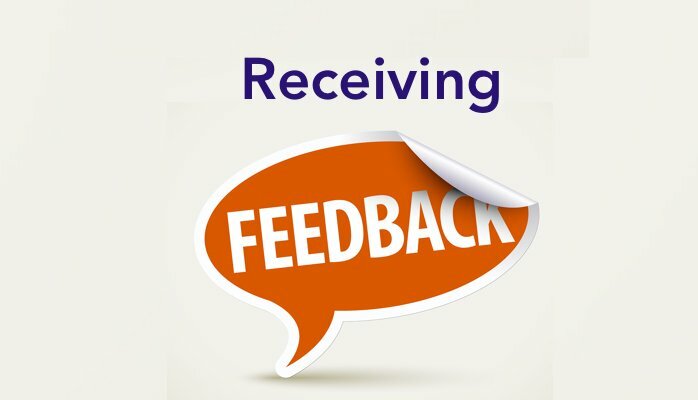 Receiving feedback is a skill we all need to learn in order to keep growing and developing. Appreciation: Say thank you. Acknowledge a job well done. Coaching: Develop skills e.g. speaking or golf coach. Intent vs action. We judge others by their behaviour and ourselves by our intentions. Take this into account when listening to feedback. The way the feedback is delivered may not be as altruistic as it was intended. Be proactive. Take steps to initiate a feedback conversation. Being proactive takes some pressure off the person giving the feedback. Giving feedback can be awkward and uncomfortable; it is far easier when someone asks for feedback instead of having to force it on them. When we are asked it is easier than when we “have to”. Frame the request. When we initiate a conversation we can frame the conversation to ask for specific feedback on a particular area. 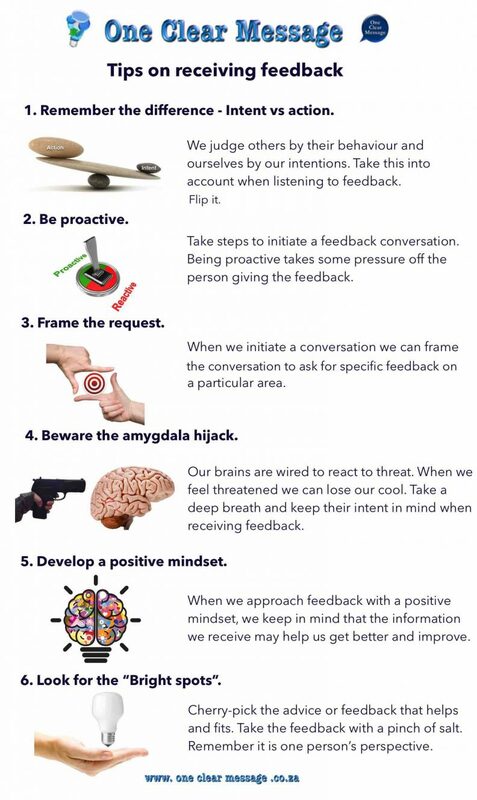 Beware the amygdala hijack. Thousand’s of years ago our brains reacted instinctively to imminent threats (lions and tigers). 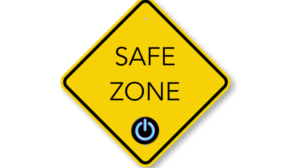 Today there is less chance of attack by wild animals but there are drivers that cut us off, annoying colleagues, misbehaving children, and numerous other situations that may lead to an amygdala hijack. When we feel threatened we can lose our cool. Take a deep breath and keep their intent in mind when receiving feedback. Develop a positive mindset. 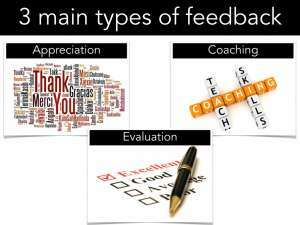 The way we perceive the feedback makes a huge difference. When we approach feedback with a positive mindset, we keep in mind that the information we receive may help us get better and improve. Look for the “Bright spots”. Take the feedback with a pinch of salt. Remember it is one person’s perspective. Cherry-pick the advice or feedback that helps and fits.